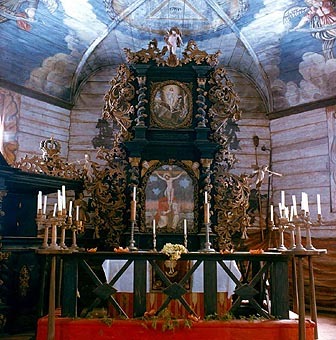 Lutheran church built in 1704 near the lake of Usma (close to Kuldiga town) was moved to Open-Air Museum in 1935. 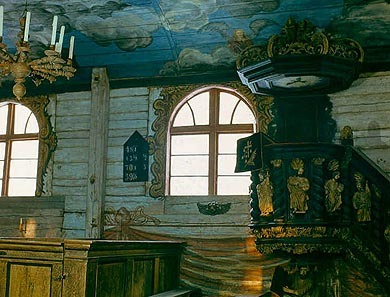 The church has been rebuilt and renovated several times, organ was made by Kreslinsh, organ craftsman from Jekabpils, in 1860. There is a pillory and a punishment equipment near the church – it was a characteristic feature till the second part of the 19th century that the mentioned things were placed near churches. 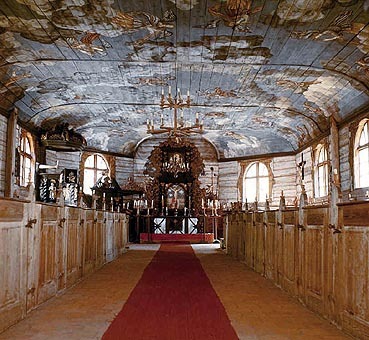 Usma church is a prominent monument of Kurzeme district, the painting of the ceiling is one of a few, left from the great number of decorative church paintings in Courland (Latvian: Kurzeme).